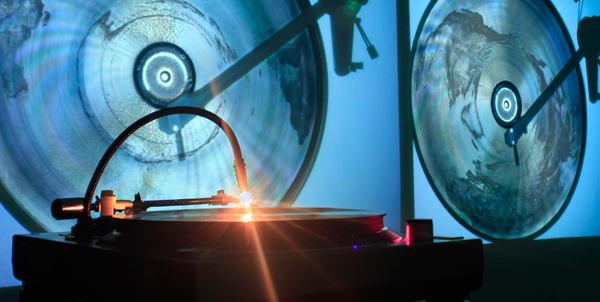 Among the media used for artistic purposes, the vinyl record has played a special role. It has been around for more than a century and has outlasted many others. It is one of the very few media that can function without electricity and its kinetic characteristics, the material encoding of sound and its iconic (yet adjustable) form have all contributed to making it attractive for a multiplicity of experiments. The Art Of Failure (Nicolas Maigret and Nicolas Montgermont) have realized a new artwork with the collaboration of the ArtKillArt label. “Earth to Disk” conceptually reverse engineers the groove engraving. Technically the exact elevation data of the Earth, taken from NASA databases, has been converted in an audio waveform with Pure Data, and then precisely engraved on a dub plate. Part of their “Flat Earth Society” project (dealing with the cultural flattening of global distances and differences) this work is both a representation and a sonification in a single listenable place, coding/decoding the world morphology at the right RPM rate.